Melbourne, Australia, summer, 40C+, bushfires burning around the country, tropical storms and floods in the north, sharks waiting off the coast for unsuspecting swimmers.Time for sport - TENNIS – The Australian Open, the first Grand Slam tournament of the year and the role social media has also played in this game of tennis in the past two decades. This year, over a two week period in January, around three quarters of a million people came from all over Australia and the world, including famous celebrities and sports stars from the past, all looking comfortable and at ease from prying eyes, they came to enjoy the tennis, and indeed looked as though they were doing exactly that without being interrupted by adoring fans, they melted into the audience to watch the events. The world’s players, hundreds, flying in on 24 hour plus flights fresh from their big 3 week break since the end of the last season. Lots you recognize, most you don’t. Come for the big prize and fame - $A2.5m for the winners. Even first round losers get $A20,000+. Changes over the years for the tournament that started in 1905, used to take 45 days by ship to get here to play for peanuts. Air travel only started in the late 1940s. Media coverage across the world, used to be radio and telegrams to write up newspaper reports. When IBM became Tennis Australia’s technology partner, who would have imagined how fast and innovative these technical advances would be? Within two decades these technological advances has allowed Social Media to transform the staging and communicating of the Australian Open into what it is today, a fantastic international event which can now be viewed in real time and the rest of the world can be here with you via cyber technology. Gone are the days of other eras, and now, every player has a twitter account, a Facebook account and a personal website and all use these tools and apps to convey to their followers what they are doing. For example, Serena Williams alone has 1.3 million Facebook likes on her Facebook page, and ensures social media is growing by the minute. Today players use this technology to develop strategies, obtain match statistics, and fans can use this data analysis to gain greater understanding of their favorite players matches and the game of tennis. The Australian Open official website is one site that is way ahead of the other sports sites, and is a good example of how social media now plays such a vital and important role in the dissemination of information to the rest of the world as it happens and when it happens. The technology behind social media today has made this year’s event one of the greatest watched tournaments in the world, successfully employing cyber space, and included a record capacity-filled audience for Melbourne. It is living proof of where and how social media has evolved into a way of life as Australian’s embrace the 21st century. Web coverage. 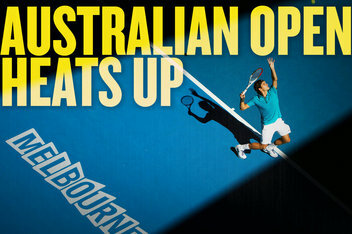 A serious official site is: http://www.australianopen.com/index.html with every statistic possible, video, photo, facebook, twitter, iPad apps. Connection and interaction possible across the range of social media and digital channels, disseminating this event to all areas of the globe as play happens.